THAT ONE ABSOLUTELY BEAUTIFUL THING……..THE MUNSTER HURLING CHAMPIONSHIP! Nothing beats being there! 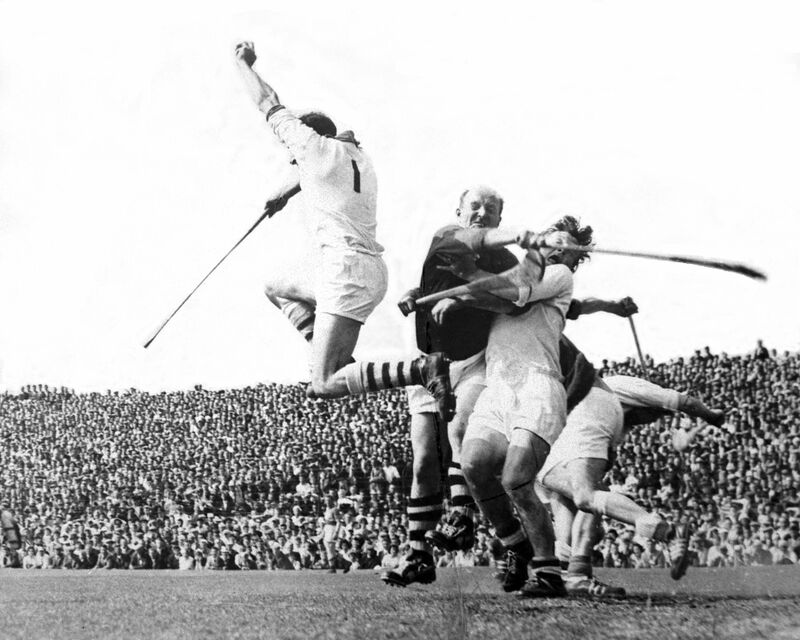 Goalmouth ‘shamozzle’ in Thurles during the 1962 semi-final between Cork and Waterford. Ned Power saves despite the close attention of Christy Ring. I have many different passions but there’s a special one that rages in my middle-aged heart. Many people may think I am mad but it is the idealism of the majestic, elusive Munster Hurling Championship that makes my heart beat faster day after day. Close your eyes …. Think of summer. What do you see? I see midges swooping and dancing through a languid sunset. I see heatdrenched Limerick jerseys shuffling through the streets of Thurles where bellows of banter waft along with the whiff of cider that floats from the open doors of packed pubs in Liberty Square. Inside DD Corbett’s a bitter alcoholic draws tears from the crowd with a soft, sweet rendition of ‘Slievenamon’. On a street corner a humming chipvan mumbles its invitation to giddy children as the June sun beats down. The Pecker Dunne sits, perched on a flat stone wall, plucking and strumming, twanging banjo chords as he winks at those who pass. A smile broadens his foggy beard as coins glint and twinkle from the bottom of his banjo case. Hoarse tinkers flog melted chocolate and paper hats on the brow of a humpbacked bridge as we move closer to the field of legends. The rattle and drone of kettle-drums and bagpipes rise from the Sean Treacy Pipe Band as they parade sweat-soaked warriors around the green hallowed sod. A whistle rings on high, ash smacks on ash and the sliothar arrows between the uprights. A crash of thunder and colour erupts from the terraces …… I see the Championship!!! The Championship is something special. What else has such a choking grasp on an Irishman’s heart? What else has the power to cram Knockaderry Church on a Saturday night and leave it sleeping on Sunday Championship mornings? What else draws the likes of Mike Quilty and Mike Wall and sits them among roaring, red-faced lunatics in the shadow of the crowded Old Stand? What else exists that plucks the cranky farmer from the milking parlour and flings him into a concrete cauldron eighty miles across the province? There are those who swear the Apocalypse would not have the same effect…. ….. But oh to be a hurler …. To sprint from the tunnel in Limerick like a greyhound from the traps. To hear the eruption from forty thousand sunburnt fans, to see the swish of flags among a sea of faces. …. But oh to be a hurler… If the truth be known I couldn’t hurl spuds to ducks. The boss of my hurley has seen the arse of a Friesian cow more often than it has the crisp leather stitching of an O’Neill’s sliothar! Okay, I’ve had my own All Irelands up against the gable end and in and around the mother’s flower beds but that’s as far as it went for me. My dad was the same but come May and the chirp of the sparrow, you can be guaranteed we’d be stuck in that long snake of traffic, as it slithered its way to Cork, Limerick, Thurles and other far flung fields. The terrace is where the real nectar of hurling comes to a head – when every Joe Soap in the country stands together on the same patch of cement with their eyes fixed on the same lush, green carpet…..
Open your eyes again…. The hazes of summer lie in distant days as the chilled weathergods spit and splutter their wintry flu over the land. And there’s that sodden Minister for Finance, Michael Noonan, on the box waffling about stability, and growth, and austerity and ….Oh for God’s sake roll on the Championship!! ….. IS THE MUNSTER HURLING CHAMPIONSHIP! One of my favourite, enigmatic sports’ photos of all time! Mick Mackey (umpire) and Christy Ring have a few words as Ring is forced to leave the fray during the 1957 Munster semi-final. The following is a fabulous hurling story taken from the archives of the oft lamented hurling website, An Fear Rua. Michael Walsh captained The Rower-Inistioge to their only Kilkenny county senior hurling title in 1968. He died on January 10th, 2012. His son Patrick wrote this moving memoir of his father…. There was no shelter from the unseasonal heavy misty rain on that mild January morning when we turned onto Friar’s Hill. The hearse belching fumes five yards in front of us afforded no cover and we wouldn’t have wanted it any other way. The dark suits, white shirts and black ties of the men were soaked in an instant. The careful preparations of the womenfolk to hair and clothes were drowned in a spiteful but comforting grey mist. Rain is for funerals. It provides a cloak of darkness for the pain of the bereaved and it allows the sympathisers to somehow share the hurt if only fleetingly. Sunshine is for weddings and heroic summer hurling. Hurling bubbles in our family’s blood, so for the life of me I couldn’t fathom how I had never seen this book before. On the table stacked high in the bookshop was ‘Kilkenny Senior Hurling Champions 1887 – 2003’ by Dermot Kavanagh. Staring out at me from the pages detailing the 1968 final was my father’s picture with the note identifying him as captain. Tears filled my eyes in the bookshop. That was his Christmas present sorted for what we all knew would probably be his last. From the middle of November it was obvious that he would never leave the house again. One of his last big days out was to the funeral of a former Kilkenny All Ireland winning captain who was married to his sister. Afterwards, he shared pints and stories over a long afternoon with men he hurled against long ago. The great bundle of energy that is Sam Carroll said to him, ‘It will be your turn next year’ referring to the Kilkenny County Board’s policy of honouring the county champions of the past. Without missing a beat he smiled and said he was looking forward to it but both of us knew his deteriorating health would have taken him from us long before then. These days his limited eyesight was saved for the donation to the bookmakers’ benevolent fund that was his daily trawl through the racing pages. Sitting at his bedside I offered to read to him the pages covering the 1968 final from Dermot Kavanagh’s book. He would never have asked. That was his way. Before we reached Mill Street we could see them. Lining both sides of the street opposite the Ollie Walsh Memorial were the men of ’68 whom he had led into battle on an April Sunday in ’69 to claim his parish’s one and only Kilkenny Senior Hurling Championship title. Over their shoulders was slung the club jersey which was their battledress on that Sunday nearly forty three years ago. I still think the lid of the coffin lifted as his chest swelled with pride at the sight of these great men gathered to give him a guard of honour along the streets of the neighbouring town he had made his home for over forty years. A few days after Christmas my mother rang and said he wants to see you urgently but he won’t say what it’s about. I sat on the bed and heard him ask me through shortening breath, to write to Dermot Kavanagh, the author of the book who had also played on the team, to thank him for the acknowledgement of the separate picture identifying him as captain. He had missed the celebratory dinner in New Ross due to illness and his centre-place as captain in the picture of this event, which was also in the book, had been filled by the great Eddie Keher. He seemed to be opening up so I decided to test the water. With the simple words, ‘What position did you play in against Éire Óg’, an ever increasing torrent of memories flooded his head. He became frustrated as their delivery was slowed by the damming effect of his shortness of breath. I heard for the first time his recollections of the 1968 championship. He was picked out of position, centre back to mark Tommy O’Connell, the Kilkenny star forward, against Éire Óg in the first round. The quarter final versus Thomastown was postponed until the Spring of ’69 to allow Ollie Walsh to return from an unfair suspension imposed following a Kilkenny v Tipperary brawl in the National Hurling League. Again, he was picked to do a job. Cha Whelan had to be marked, so he started full forward. Freshford were the opposition for the semi – final and he was picked full forward to stop Pa Dillon, the great but fearsome Kilkenny full back of the 1960’s. In his bed he told me, in slightly less than parliamentary language, that he feared for his life and that if Pa was to walk into the bedroom there and then, he’d still be afraid. I’m too young to remember Pa hurling but I’ve met him at numerous hurling dinners etc and have found him to be one of the most softly spoken, obliging Kilkenny heroes of the past. I’m sure the truth of Pa’s legend is somewhere in between. Dermot Kavanagh’s touching handwritten letter arrived within two days. After the funeral, he told me that on reading our letter of thanks he just sat down and wrote his reply in one draft. That night at his bedside I read him Dermot’s reply ….’Believe me it was no problem giving your Dad due acknowledgement. He was a brilliant hurler and sincere servant of the club’…. He ‘was always picked to play on other such greats as Paddy Moran, Martin Coogan and Sean Buckley when the occasion demanded’….’ I can safely say that all the senior statesmen of that team were great men, none more so than him’…’ Probably his greatest outing for the club was last September when at very short notice, and clearly unwell, he led the guard of honour for Pudsey Murphy’s funeral. A tough task but admirably undertaken’. When I finished reading a smile took over his face and his eyes filled up as he reached out to grip the back of my hand. Nothing was said because nothing needed to be said. That was his way. The rain relented. It’s possible the sporting gods saw it as a sop to the amount of hurling men that had gathered to bid farewell. The ‘Men of 68’ guard of honour led the cortege to the church and his three sons and three grandsons carried him shoulder high to the altar where the Tom Walsh Cup, which he had received nearly forty three years previously, was waiting for him. We have no picture of him being presented with the cup on county final day or of him being carried shoulder high with it from the field so it’s a sight that will be branded on our memories forever. At the graveside a face we all knew approached my mother. Before he could offer his condolences she smiled and said, ‘They tell me he hurled the socks of you’. Seamus Cleere, the prince of Kilkenny centre backs laughed and hugged her. He had been picked centre forward in the county final against Bennettsbridge to stop the great Seamus Cleere. In the ‘Irish Independent’ report of the match neither of them got a mention. Job done. He never said anything to us about it. That was his way. THAT ONE ABSOLUTELY BEAUTIFUL THING…. I have many different passions but there’s a special one that rages in my middle-aged heart. Many people may think I am mad but it is the idealism of the majestic, elusive All Ireland Hurling Championship that makes my heart beat faster day after day. Close your eyes …. Think of summer. What do you see? I see midges swooping and dancing through a languid sunset. I see heatdrenched Limerick jerseys shuffling through the streets of Thurles where bellows of banter waft along with the whiff of cider that floats from the open doors of packed pubs in Liberty Square. Inside D D Corbett’s a bitter alcoholic draws tears from the crowd with a soft, sweet rendition of ‘Slievenamon’. On a street corner a humming chipvan mumbles its invitation to giddy children as the June sun beats down. The Pecker Dunne sits, perched on a flat stone wall, plucking and strumming, twanging banjo chords as he winks at those who pass. A smile broadens his foggy beard as coins glint and twinkle from the bottom of his banjo case. Hoarse tinkers flog melted chocolate and paper hats on the brow of a humpbacked bridge as we move closer to the field of legends. The drone of kettle-drums and bagpipes rise from the Sean Treacy Pipe Band as they parade sweat-soaked warriors around the green hallowed sod. A whistle rings on high, ash smacks on ash and the sliothar arrows between the uprights. A crash of thunder and colour erupts from the terraces …… I see the Championship!!! The championship is something special. What else has such a choking grasp on an Irishman’s heart? What else has the power to cram Knockaderry Church on a Saturday night and leave it sleeping on Sunday Championship mornings? What else draws the likes of Mike Quilty and Mike Wall and sits them among roaring, red-faced lunatics in the shadow of the crowded Old Stand? What else exists that plucks the cranky farmer from the milking parlour and flings him into a concrete cauldron sixty miles across the province? There are those who swear the apocalypse would not have the same effect…. Some of my earliest memories are of ‘The Championship’. I remember travelling with my father in Tom Howard’s black Morris Minor for the Munster semi-final in 1962 to see Ringy and the Rebels take on the might of Tom Cheasty, Ned Power and Frankie Walsh’s Waterford. Another day in Cork, saw me crammed like a sardine behind the city goal as I watched Cregan and Grimes emerge to mesmerise the Premier County. Another vivid memory is of Glenroe’s own ‘Banger’ O’Brien with blood streaming from his temple, raising a fist to the crowd, ‘Waterford are bate and Limerick are in the All Ireland!’ ….. But oh to be a hurler …. To sprint from the tunnel in Limerick like a greyhound from the traps. To hear the eruption from forty thousand sunburnt fans, to see the swish of flags among a sea of faces. It’s only something I can dream about but nonetheless it’s the greatest passion that rages in my heart. If the truth be known I couldn’t hurl spuds to ducks. The boss of my hurley has seen the arse of a Friesian cow more often than it has the crisp leather stitching of an O’Neill’s sliothar! Okay, I’ve had my own All Irelands up against the gable end and in and around the mother’s flower beds but that’s as far as it went for me. My dad was the same but come June and the chirp of the sparrow, you can be guaranteed we’d be stuck in that long snake of traffic, as it slithered its way to Cork, Limerick, Thurles and other far flung fields. The terrace is where the real nectar of hurling comes to a head – when every Joe Soap in the country stands together on the same patch of cement with their eyes fixed on the same lush, green carpet…..
….. IS THE HURLING CHAMPIONSHIP!